A team led by Chief Executive Member (CEM), Karbi Anglong Autonomous Council (KAAC), Tuliram Ronghang, Member of Autonomous Council (MAC) Horen Sing Bey, Executive Member Ruping Teron and others from Karbi Anglong visited the residences of the victims of June 8 lynching at Panjuri Kachari Gaon under Dokmoka Police Station in Karbi Anglong district. 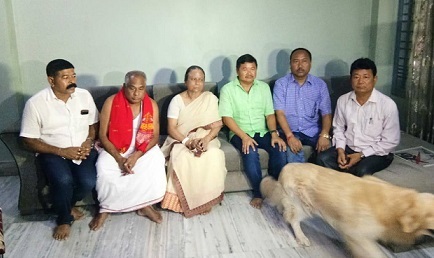 CEM Ronghang met the parents of Abhijeet Nath and Nilotpal Das at Guwahati in their respective residences and expressed condolences at the demise of the two youths at Panjuri. 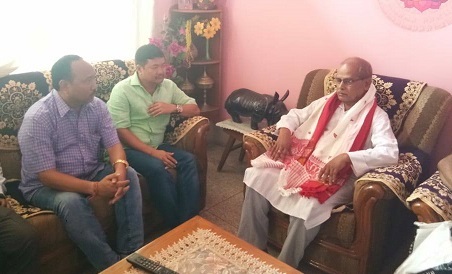 The KAAC team led by Ronghang first went to the residence of Abhijeet’s residence. During the visit, Ronghang also stated about the KAAC decision to provide Rs 5 lakh as compensation to each of the victims’ families. Ronghang also announced that a statue would be installed in the memory of the victims – Abhijeet Nath and Nilotpal Das. Nilotpal Das’ father reportedly told the KAAC team to create a peaceful environment in Dokmoka area of Karbi Anglong district and take necessary measures to educate the people of the remote area. On the other hand, as per reports, Abhijeet’s parents refused to accept the compensation amount of Rs 5 lakh announced by the KAAC authority. Abhijeet’s father urged the KAAC authority to use the compensation amount in the development activities. Ronghang demanded rigorous punishment to all the accused involved in the lynching. On the other hand, the father of Nilotpal Das told media persons that they have nothing to say regarding the place of installation of the statue.